found in the “Reference” section. • Press C to change from mode to mode. Use the Timekeeping Mode to set and view the current time and date. • The day screen shows the current day and day of the week. below to select other settings. Use D (east) and B (west). Use D (+) and B (–). 4. Press A to exit the setting screen. • The year can be set in the range of 2000 to 2099.
it except after you have the watch’s battery replaced. Time. Remember that not all countries or even local areas use Daylight Saving Time. 2.Press C to display the DST setting screen.
) and Standard Time ( ). 4.Press A to exit the setting screen. Mode screen while Daylight Saving Time is turned on. 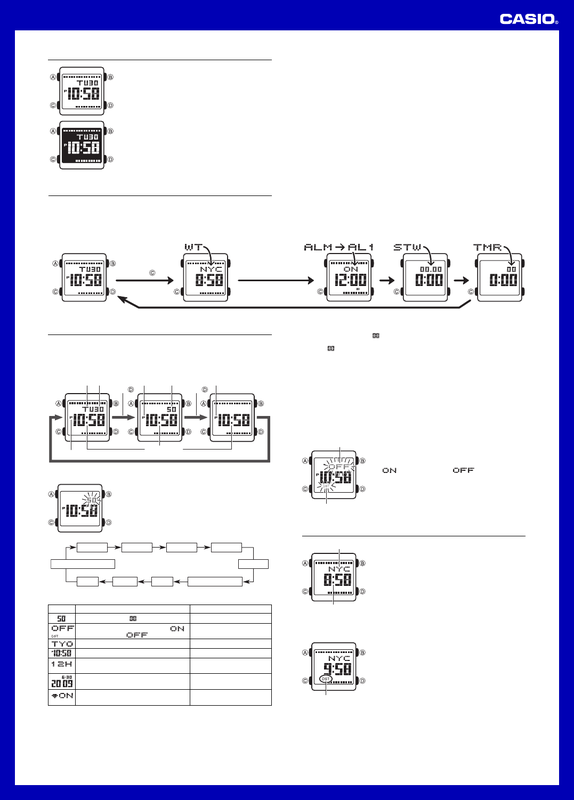 • See “Daylight Saving Time (DST)” for details about the DST setting. the hour digits for times in the range of midnight to 11:59 a.m.
applied in all other modes. World Time Mode, which you enter by pressing C.
setting you want to change. Standard Time (DST indicator not displayed).